Diabetic Retinopathy Can Lead to Blindness! Diabetic retinopathy is a complication in the retina of the eye caused by Type I or Type II diabetes. Diabetes causes damage to the tiny blood vessels in the retina causing bleeding or leakage of fluid into the macula (central retinal area) causing edema (swelling). In later severe stages of proliferative diabetic retinopathy, new blood vessels are formed. Although these new vessels themselves do not cause problems, they are very fragile with thin walls and therefore can rupture and bleed creating severe vision loss or possibly blindness. The retinal vessels leak blood and other fluids that cause swelling of retinal tissue and clouding of vision. The condition usually affects both eyes. The longer a person has diabetes, the more likely they will develop diabetic retinopathy. If left untreated, diabetic retinopathy can cause blindness. Often there are no visual symptoms in the early stages of diabetic retinopathy. That is why the American Optometric Association recommends that everyone with diabetes have a comprehensive dilated retinal eye examination once a year. Early detection and treatment can limit the potential for significant vision loss from diabetic retinopathy. Type 1 Diabetes is caused by a decrease in or an absence of insulin production. Causes of Type 1 include: genetic, autoimmune, toxic and infectious mechanisms. The treatment for Type 1 diabetes is insulin replacement. Type 2 Diabetes is caused from insulin resistance and a deficiency of insulin that results in chronic hyperglycemia. Risk factors for Type 2 diabetes are: overeating, obesity and a sedentary lifestyle. Treatment for Type 2 diabetes includes weight loss, dietary restriction, exercise and medications that reduce insulin resistance, help insulin deficiency or delay the absorption of carbohydrates. Blood sugar can be measured under different circumstances. Fasting blood sugar or blood glucose levels is usually performed eight hours after the last meal. The normal range for fasting blood glucose is 70 to 100 milligrams per deciliter. After a meal blood sugar generally rises and in a normal individual it usually does not get above 140 milligrams per deciliter. Normal people therefore maintain a fairly narrow range of blood sugar throughout the entire day. The A1C test measures your average blood glucose for approximately the previous 3 months. It is determined by measuring the percentage of glycated hemoglobin, or HbA1c, in the blood. For diabetics, it does not replace daily self-testing of blood glucose. A1C changes as new red blood cells replace old red blood cells. The amount of A1C in your blood theoretically represents blood sugar for the lifespan of a red blood cell, which is about 120 days. In a person who does not have diabetes, about 5% of all hemoglobin is glycated. A1C levels can range from normal (5%) to as high as 20-25% if blood glucose is out of control for extended periods. Although the A1C test is an important test it doesn't measure blood sugar day to day to allow a diabetic to adjust medicine. It is worth noting that different labs measure A1C levels in different ways and the results can vary among labs. An A1C level at one lab does not necessarily equal the A1C level at a different lab. It is estimated that for every 1% increase in A1C, the risk of developing diabetic retinopathy increases by 21%. Many people think Type 1 is the “bad” diabetes and believe Type 2 is relatively mild. When it comes to ocular complications of diabetes, it is seen in both types of diabetes. The second misconception is that Type 2 is only a disease of older people. Right now, 50% of Type 2 cases occur in people less than the age of 60. Children are now becoming Type 2 diabetics due to the rising epidemic of obesity. Diabetes mellitus is becoming the leading public health concern of this century with a prevalence of 300 million diabetics worldwide. Estimates from the International Diabetes Foundation predict 438 million diabetics by 2030. Almost 30% of U.S. adults over the age of 40 that have diabetes also have diabetic retinopathy. About 4% of this group has serious vision threatening diabetic retinopathy. The chance of having diabetic retinopathy increases every year a person has diabetes. In an attempt to improve blood circulation in the retina, new blood vessels may form on the retinal surface. These fragile, abnormal blood vessels can leak blood into the back of the eye and cause vision loss. 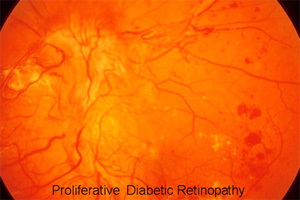 Proliferative diabetic retinopathy (PDR) is the more advanced form of the disease. At this stage, circulation problems cause the retina to become oxygen deprived. As a result new fragile blood vessels can begin to grow in the retina and into the vitreous, the gel-like fluid that fills the back of the eye. The new blood vessels may leak blood into the vitreous, clouding vision. If left untreated, proliferative diabetic retinopathy can cause severe vision loss and even blindness. There are also some indirect ocular complications of diabetes. These vision-threatening ocular diseases tend to occur with greater frequency in a diabetic patient and include: Cataract, Age-related Macular Degeneration and Glaucoma. In the early stages of Non-proliferative Diabetic Retinopathy, treatment other than regular monitoring may not be required. Following strict guidelines for diet and exercise and keeping blood sugar levels well-controlled can help control the progression of the disease. If the disease advances, leakage of fluid from blood vessels can lead to macular edema. Laser treatment (photocoagulation) is used to stop the leakage of blood and fluid into the retina. A laser beam of light can be used to create small burns in areas of the retina with abnormal blood vessels to try to seal the leaks. Intravitreal injections of anti-VEGF factors and steroids are currently in trials for treatment of diabetic macular edema. When blood vessel growth is more widespread throughout the retina, as in proliferative diabetic retinopathy, a pattern of scattered laser burns is created across the retina. This panretinal photocoagulation causes abnormal blood vessels to shrink and disappear. With this procedure, some side vision may be lost in order to safeguard central vision. Persons with diabetic retinopathy can suffer significant vision loss. Special low vision devices such as telescopic and microscopic lenses, hand and stand magnifiers and video magnification systems can be prescribed to make the most of the remaining vision. The best way to treat diabetic retinopathy is to treat the underlying systemic disease and control blood sugar. Diabetic retinopathy in its early stages usually has no symptoms or early warning signs. Don’t wait for problems. Have your eyes examined once a year!